XCTest is XCode5, iOS7 feature for Test. When you create new project(included test), you can see Test Case. When creating new project, test is automatically generated. Look at above. 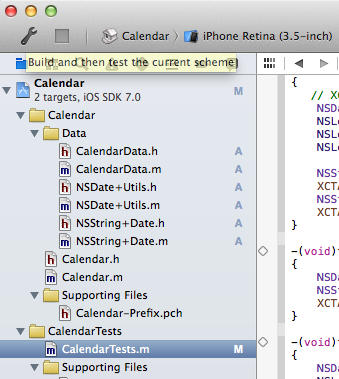 CalendarTest is test. By default, there is failed test case in test project. To run test, you long press “Run” and switch to “Test” button. Above picture shows Test button. After changing “Test” button, press test button(not long press). At first time, you can see link error I thought. (in my case). To try test, but an error is coming. It seems that something forget to link. There is nice solution on biasedbit. Start test, emulator opens and run test. After finishing, you can see result. You can also see project perspective view. You can see place the test failed. If you add other name methods, they won’t be executed. Same as other platforms, they prepared Assert methods to use in Test. XCTAssertEqualWithAccuracy(a1, a2, accuracy, format…) The differences between a1 and a2 is expected to be within accuracy. XCTAssertNotEqualWithAccuracy(a1, a2, accuracy, format…) The differences between a1 and a2 is expected not to be within accuracy.